How Can Timber Cladding Transform Your Home? An insight as to how you can transform your build with Timber Cladding. Whether you’re looking for materials for renovation work or a new build, Timber Cladding allows you to achieve a contemporary transformation visually as well as environmentally for whatever project you’re working on. Aesthetically pleasing, environmentally friendly and affordable, this desired material can create a beautiful and sustainable home. Here at Bennetts Timber, we’re going to tell you how using this method can transform your home for the better. Over time, the outside of a property can become worn down or have mismatching external materials, broken render or unattractive brickwork. Builds from the 60’s, 70’s and 80’s often suffer from this, leaving the build looking tired and dated. However, it is possible to get impressive results in an easy and affordable way with Timber Cladding. If you’re looking to transform your home with a long lasting material, then Cedar Cladding is a great option. This beautiful wood contains rich and variable colours that proves to be very popular when it comes to making over homes. Offering high resistance to decay and high durability from natural preservatives, using this wood means it’s perfect for external use and can be installed without treatment. With an added bonus of an approximate 60-year life span, cedar is a desirable option for those building their “forever home”. Larch cladding, usually Siberian Larch, is also a very popular option due to its visual benefits and cost. It has a natural ‘pine’ colour which, over the years, weathers to a beautiful silver grey colour. A striking and natural material, this is a long lasting durable wood that serves perfectly for those looking to economically transform their home into something with an attractive finish. Both cedar and larch can be factory treated with a UV protector to prolong the colour fading process, or they can be painted in a whole range of colours. Blacks, greys and ‘off whites’ are favoured choices at the moment. Not only are there are a large choice of woods available to assist with a transformation, but other details such as style, texture and finish options can encourage design innovation and allow endless possibilities for the visual outcomes. Commonly in new builds, the entirety of the house will be faced with cladding, however, this is not always necessary. An equally popular method is using wood cladding for the upper or lower half of the building, utilising other materials for the remaining walls. A contrast of painted render or brickwork is often used to great effect, resulting in a contemporary look. 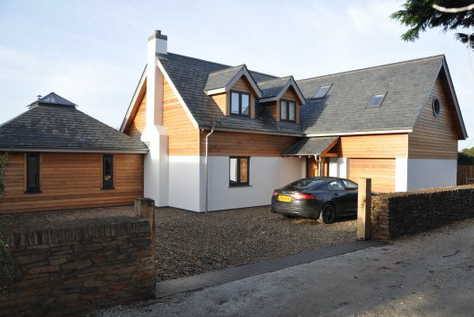 Timber cladding also allows the possibility to choose from various styles of profile, from a plain square edge and tongue and groove design, which are both ideal to create a modern look, to featheredge boards which are tapered across their width and are great for houses in rustic settingss. Although timber cladding is most commonly used externally, an alternative is to use it inside a building too. Using cladding inside your home can create a warm and natural aesthetic that is low maintenance and easy to repair, a great way to give a unique, timeless and modern feel. Visual bonuses aside, an aspect that cannot be achieved as successfully with a house using other materials is the environmental advantages which timber cladding provides. Timber cladding is a renewable resource with source certification schemes, such as FSC and PEFC, ensuring that it is sustainable. Whilst growing trees remove CO2 from the atmosphere, using wood on (or in) your home stimulates the expansion of managed forests to absorb more of the global warming gas. Therefore, if you’re looking to transform your house into an environmental friendly build, then be assured that cladding successfully does that. With the many visual benefits and environmental bonuses timber cladding offers, it’s clear to see why it’s in high demand and the way forward for many building projects.